Andover, MA – DiSH is named “Best of North Shore” for gourmet meals to go in the current edition of NorthShore Magazine. Readers submitted ballots naming their favorite spots on the North Shore and 9-month old DiSH is already standing out as a local favorite. 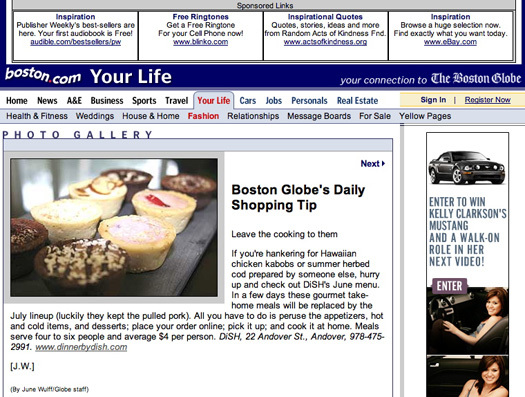 In fact, so many readers suggested DiSH for “gourmet meals to go” that the magazine added the category. DiSH has emerged as the north shore's leading "Gourmet To Go" business. As a high-quality alternative to fast food and take out, DiSH creates delicious and nutritious family sized meals that customers cook in their own homes. DiSH's menu changes every month, featuring a variety of fresh entrees that include beef, pork, chicken, seafood and vegetarian choices. Andover, MA - Dish, LLC today announced that Co-founders and Co-owners Amy Aycock and Lea Savely are nominated for the Greater Lawrence/Merrimack Valley's 2006 "Women of Achievement" award. The YWCA recognizes women who demonstrate superior contributions and exceptional advancement in their professions, and an outstanding commitment to community. A committee, representing a cross-section of businesses and community leaders, will review all nominations and make final selections. Honorees will gather during an awards luncheon on May 11, 2006 at the Andover Country Club. Aycock and Savely are honored to be recognized together and are proud supporters of the YWCA. As Merrimack Valley residents, Aycock and Savely are deeply committed to the community. Inspired by the idea of facilitating mealtime for busy people, the two women have helped to feed those who hunger. In the 7 months since its opening, DiSH has donated over $4,000 in cash, meals and groceries to various organizations in the area. at 22 Andover Street in Andover, MA (978) 475-2991 and open weekdays until 3 PM, Tuesday's and Thursday's until 6 PM and Saturday's from 9 - 11 AM.